Published: Feb 24, 2014 · Modified: Jan 10, 2019 · By Jen Sobjack · This post may contain affiliate links. 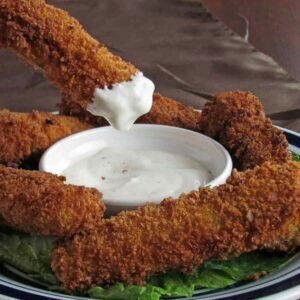 Fried Pickle Spears are Panko crusted dill pickle spears fried in a skillet until golden and crunchy. Have you ever had fried pickles? As unusual as it may seem, this tangy and crunchy treat is a culinary delight. It is not uncommon to see fried pickles listed as an appetizer on the menu of “southern” restaurants. Typically fried pickles are made with the bite-sized burger chips but I like using the spears. They pack more of a tangy punch and require less seasoning in the batter. How to make fried pickle spears? I started by laying the spears out on paper towels to drain off excess moisture. I even blotted them a bit then dredged them in flour and egg before adding the panko crust. This method worked out perfectly, the panko breadcrumbs adhered to pickle spears and after frying, they turned golden and crunchy. 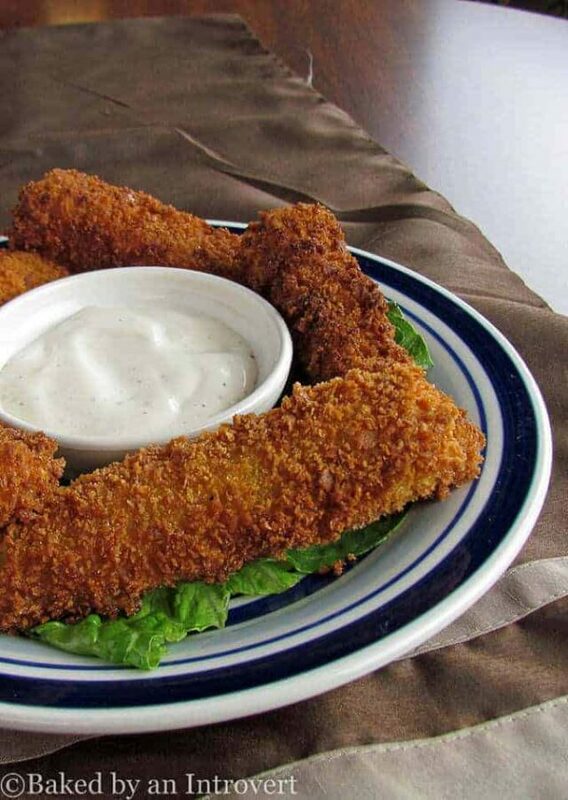 Serve the fried pickle spears with ranch dressing as a dipping sauce and you have the perfect appetizer. 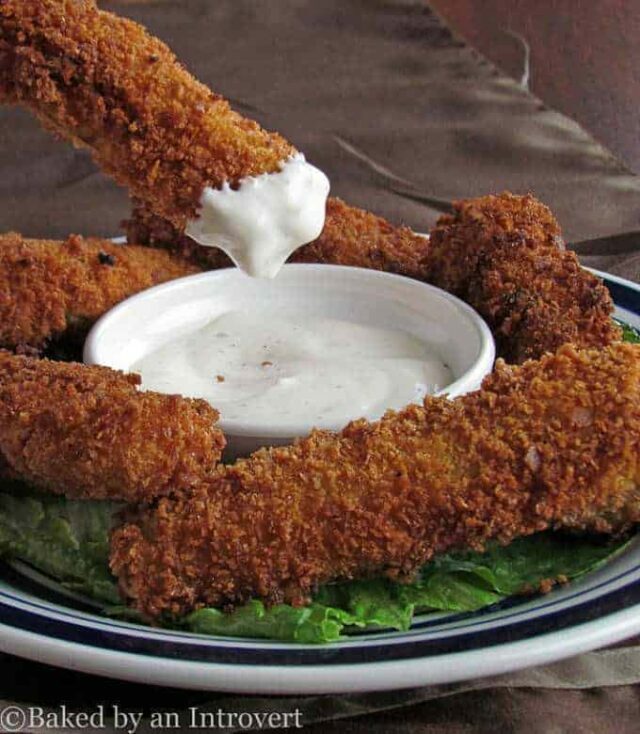 If you make this fried pickle spears recipe, please let me know how you like them! Did you try a different sauce? I’d love to hear about your experience. Panko crusted dill pickle spears fried in a skillet until golden and crunchy. Heat oil in a 12-inch skillet over medium-high heat. Place pickle spears on a plate with paper towels, blotting gently to remove excess moisture. Place flour in a shallow dish. Add eggs to another shallow dish and beat gently with a fork or whisk. Place panko breadcrumbs in a third shallow dish. Dip each pickle spear into the flour, then into the egg, back into the flour, then back into the egg, and lastly into the breadcrumbs. Be sure to coat well with the breadcrumbs. Fry in hot oil for 2-3 minutes on each side or until deep golden brown. Drain pickles on a cooling rack set over newspaper or paper towels. Serve with ranch dipping sauce. I had always loved ordering these at restaurants so I thought I’d take a shot at this myself. Really loved your pictures, they helped me follow the recipe perfectly – they turned out great! Thanks so much for sharing! Hi Sam! I’m so happy to hear that! Fried pickles have always been a favorite of mine! Mouth is watering! These sound delicious. They remind me of fish sticks but even better. Can’t wait to try these at home. Thank you for sharing! You can try coating them with flour after blotting them with a paper towel. This will help the batter “stick” to the pickle. Also, make sure the oil is up to temperature so the batter will cook quickly. do you think these could be baked? Maybe spraying them with cooking spray when they go in a hot oven? I haven’t baked them before, but it is worth a try. Spraying them with cooking spray before they go in should help them crispen up. Let me know how they turn out! Plain panko crumbs or seasoned? So many options in the store now! Ugh. I used plain, but feel free to experiment with any of the seasoned ones! Delish!! I added Cajun seasoning to the flour and will smash up the panko a bit more next time. Thanks for a great recipe!! Thank you, Marie. I know you will enjoy them!